The decline in biodiversity and the associated loss of plant species are greatly affecting ecosystems. Thus far, this has been shown by studies in the so-called grasslands, i.e. in areas that are not covered by buildings or are dominated by woody vegetation. A team of biologists from the University of Freiburg has now been able to show that the loss of tree species in forests destabilizes insect communities and their interactions with each other and with plants. Tree diversity in forests is therefore important for stabilizing the insects' food webs. They present their results in the current issue of the international journal Proceedings of the Royal Society B. The research led by Dr. Felix Fornoff, Dr. Michael Staab and Prof. Dr. Alexandra-Maria Klein at the Chair of Nature Conservation and Landscape Ecology investigated aphids and cicadas that feed on the sap of various trees. The biologists also took a closer look at what is known as trophobiosis, an interaction between aphids and cicadas with ants. During trophobiosis, aphids and cicadas secrete honeydew, a kind of sugar water, for ants. In return, they protect them from enemies. All participants thus have an advantage and enter into a symbiosis through this interaction. In a 50-hectare forest experiment in China, 600 experimental plots contain tree species in monocultures and mixtures of up to 16 different species. In this setup, the Freiburg researchers have investigated over 10,000 trees and several 100,000 leaves for these aphid/cicada-ant interactions. They were able to show that as the diversity of tree species increases, more species of aphids, cicadas and ants occur. According to the results, tree species diversity is decisive for the diversity of insect species associated with trees. 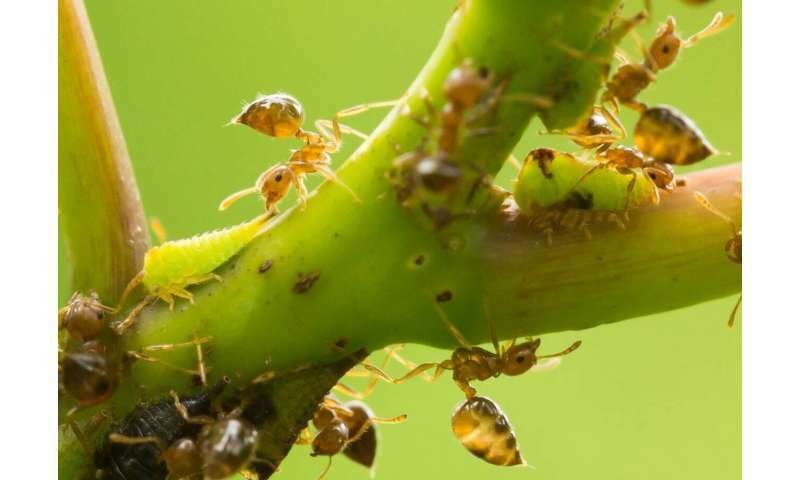 Furthermore, by analyzing the food webs, the team led by Fornoff, Staab and Klein were able to show that with increasing tree species diversity, each aphid and cicada species interacts with more tree species and that each ant species uses more species as partners for its symbiosis. The researchers describe the diversity of interaction partners as redundancy in the food web. This means that the food of aphids, cicadas and ants is not lost in species rich tree populations under changing environmental conditions.